Registration for the December 1, 2012 9-12 AM, located at Peoria – Lakeview Room of Rio Vista Recreation Center 8866 W. Thunderbird Road, Peoria is now open; (note: this class was originally scheduled for Oct 13, but was postponed). Please visit free-ready-to-ride-classes for more info, and to register. The “news brief”, print edition of Arizona Republic p.B2, 11/30/2012. PEORIA, Ariz., 7 a.m. Nov. 20, 2012 — Reconnect with the outdoors, leave your car behind and pedal your way to a healthier lifestyle while improving air quality by attending this bicycle workshop. 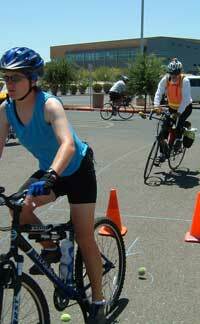 The workshops is scheduled 9 a.m.-noon Saturday, Dec. 1 at Rio Vista Recreation Center, 8866 W. Thunderbird Road. Learn about bike safety, Arizona traffic laws and the various opportunities to travel by bicycle to your favorite amenities and leisurely trips. The workshop is part of Peoria’s Sustainability University. Register for the workshop by visiting the Sustainability University website.